Compassionate, hardworking and loving are just a few words to describe a remarkable lady. She was a dedicated mother and wife who wanted the best life she could provide for her family. Bess loved her family and her family loved her and cherished her in return. We know that she is gone in the flesh, but she will always be in our hearts. Her kindness can never be replaced. We grieve deeply because she is no longer with us. However, we are grateful the Lord blessed us with her presence for 42 years. We will miss her dearly and she will remain in our hearts forever. 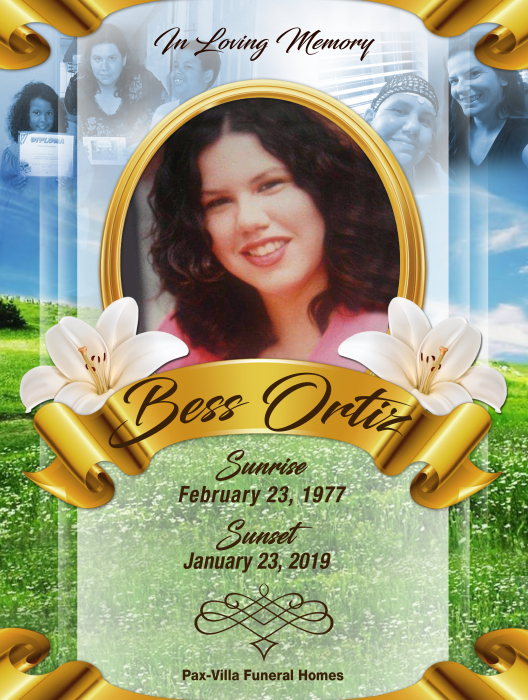 On Wednesday, January 23, 2019, Bess Ortiz was called Home to be with the Lord. Her Sister: Casilda Ortiz, other family members and friends affected by this loss.